Star Wars: The Force Awakens is a gigantic hit, with the movie recently passing $2 billion worldwide, becoming only the third movie ever to accomplish that milestone, following Titanic ($2.1 billion) and Avatar ($2.7 billion). 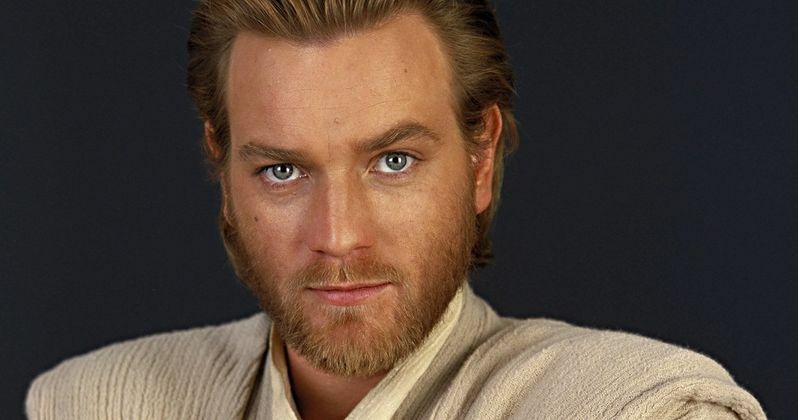 The movie offered quite a few surprises for fans, as we learned that Ewan McGregor came in to record a voice cameo as Obi-Wan Kenobi during a critical scene with Rey (Daisy Ridley). The actor recently appeared on Jimmy Kimmel Live!, where he revealed how his cameo came about, and that he was waiting for two years for J.J. Abrams to call him in. "I'd been waiting for the call to come for two years. I thought maybe they've lost my agent's phone number. Then I got a call from JJ (Abrams) just shortly before the film was released. He asked me to come in and said, 'I'd love you to be a part of it.' There's a sequence where we could use a voice, we hear Obi-Wan Kenobi's voice coming from the distant reaches of The Force, or wherever it does come from. I said, 'Yeah, I'd love to be in it. I've been waiting for your call.' I went in and I was able to see parts of it before anyone else had seen, and I was very impressed and I recorded a line for it." Shortly after the release of Star Wars: The Force Awakens, J.J. Abrams confirmed that this scene also has a most unexpected cameo from the late great Alec Guinness. The actor explained how the filmmakers found an old line of dialogue from the actor that they edited so he was actually saying "Rey." Take a look at what the actor had to say below. "The line is 'Rey, these are your first steps.' But they got Alec Guinness to do 'Rey,' which is extraordinary because he's not alive anymore. They got a line of his as Obi-Wan Kenobi saying 'afraid,' and they just cut the A and the D off and they got 'Rey.' So he says 'Rey,' and I say 'these are your first steps.'" Star Wars: The Force Awakens is just the beginning. This blockbuster will be followed by the first Star Wars spinoff, Rogue One: A Star Wars Story, which is currently in production and set to hit theaters on December 16, 2016. Director Rian Johnson's Star Wars: Episode VIII is slated for release on May 26, 2017, with Star Wars Anthology: Han Solo Movie arriving on May 25, 2018 and Star Wars: Episode IX premiering sometime in 2019. Lucasfilm is also developing a Third Star Wars Spin-Off Movie, which is presumably set to arrive in 2020. Take a look at the video below from Ewan McGregor's appearance on Jimmy Kimmel Live!.